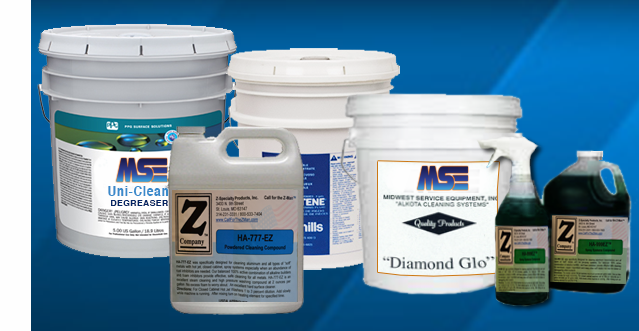 Midwest Service Equipment can provide numerous products to meet your needs, MSE has a variety of detergents, liquid wax, degreasers, rust inhibitors and salt neutralizers that will work with your pressure washer to produce excellent results. Our products are 100% biodegradable. Specifically designed for cleaning aluminum and all types of "soft" metals with hot jet closed cabinet spray systems especially when a lot of rust inhibitors are needed. Used to clean and brighten unpainted aluminum surfaces without damage. Z-Specialty Products offers a product specifically designed for cleaning aluminum transmissions and all types of "soft" metals that need hot jet-spray systems. Designed to clean over the road tractor/trailers and other types of commercial vehicles. It will clean painted surfaces without damage. High quality degreaser that contains an organic solvent to dissolve grease, oil, mold, mildew, soap scum, etc. Great for cleaning RVs, buildings, trucks, trailers, etc. When you partner with MSE, you get cleaning solutions that will protect your bottom line.